PS: The Nonna Knives will be back Soon!!!!! Give a Dedicated copy of the Cooking with Nonna Cookbook! Order the Nonna Aprons to look and cook like... Nonna! 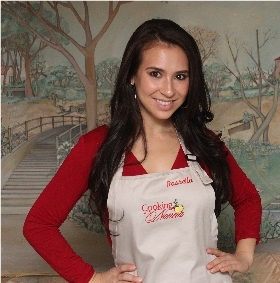 The Cooking with Nonna Apron is the perfect Christmas gift for anyone who loves to cook, or just anyone who loves Nonna! The one-size-fits-all Nonna Apron, is stain resistant and made from 100% cotton, with two pockets and the embroidered Cooking with Nonna logo on the front. Available only in Stone color. Feel free to personalize your apron once you receive it. All prices shown include shipping charges within the USA. We can ship outside of the USA but extra shipping charges will appy. Please contact us for details. 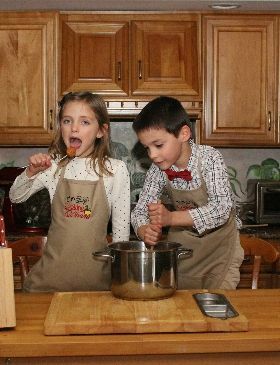 Nonna, now you can also cook with your little grandchildren and they can proudly wear their own Cooking with Nonna Apron. The Children aprons, have the same rich and high qualityCooking with Nonna logo embroidered (not printed) on the apron which has been specially designed for kids. The aprons for the 3-7 Yrs, have two large pockets, are Made in USA, are made of 65% Poly/35% Cotton 7 Oz Weight Twill and are washable and soil/wrinkle resistant. The height (from the chest down) is 20" and the width (from side to side) is 15" with a non-adjustable neck strap and long finished waist ties. This apron will fit most children ages 3-7 years old. The Children aprons, have the same rich and high quality Cooking with Nonna logo embroidered (not printed) on the apron which has been specially designed for kids. The aprons for the 8-12 Yrs, have two large pockets, are Made in USA, are made of 65% Poly/35% Cotton 7 Oz Weight Twill and are washable and soil/wrinkle resistant. The height (from the chest down) is 24" and the width (from side to side) is 16" with a non-adjustable neck strap and long finished waist ties. This apron will fit most children ages 8-12 years old. (*) All prices listed above include Shipping and Handling to all states in the Continental USA. All New Jersey residents will also be charged New Jersey State Sales Taxes. The sky is an allegory for fate. Unfortunately, the Voltinis, a family of six children and their widowed mother Norina, live under a dark sky. They all struggle to survive in a small Italian town in the 1950's. The eldest daughter, Grazia, is the beauty of the family. Norina hopes to immortalize Grazia’s beauty by having her portrait taken by the town photographer. The portraits of beautiful girls posted on the window of the photo studio are often noticed by rich men. Title: "Winter White Love Birds"
This limited edition archival art print, entitled "Winter White Love Birds", has been professionally giclee printed on beautiful acid-free "Somerset Velvet" paper. Signed and numbered by the artist; there will only be 25 printed in this format. This painting combines a folk-art style with modern fine art sensibility. Looking at the everyday world with creative color and energetic brushwork is my signature style. PS: If you bought the Nonna Knives and the Nonna Aprons, below please share a comment/review (good or bad) of the products so that other friends can use your opinion in their decision process! Grazie!! !